Do you know how to make good choices with your money? Do you have the skills needed to save or make a budget? No matter how much – or how little -- money you have, you can keep track of how much money you have coming in and going out. Pay attention to what you are spending it on. Know how much you need to save for the future. Start with a reality check. Think about which of your career choices will pay you enough money. You need to pay for housing, car payments, health care and other bills. Know the Value of Your Dollar. Learn how to manage your credit and debt. See the resources listed below or meet with a credit counselor to review your report and learn about ways to improve your credit score. Create a Personal Budget. You can plan your spending. Use calculators and online tools. Talk to a financial counselor. Save part of your money for emergencies and long-term goals. Use a retirement calculator to start planning for your future. 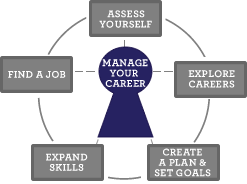 Consider updating your career plan (pdf) to include savings. Go to Assess Yourself to find jobs that match your skills, interests and goals. Explore Careers that match your financial goals.